On the same day that the repeal of net neutrality became official, two US senators demanded answers from the FCC over its dubious claims about being targeted by cyberattacks. The FCC has said it was the victim of a cyberattack in 2017 following a segment on comedian John Oliver’s HBO Show Last Week Tonight, in which Oliver asked viewers to flood the FCC’s comment system with pro-neutrality comments. 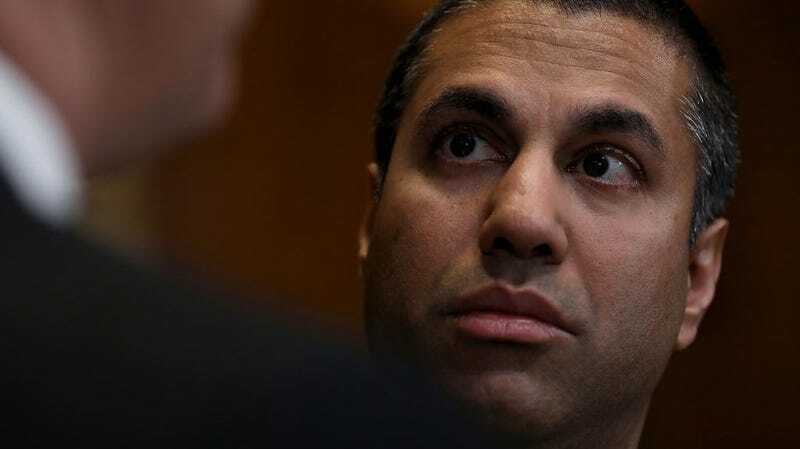 Emails recently obtained by Gizmodo show senior FCC officials under the current chairman, Ajit Pai, backed its assertion of a cyberattack last year with unsupported claims that the same thing happened in 2014, but that it was kept quiet by former chair Tom Wheeler. The agency has since gone dark and refused to answer questions about the so-called cyberattacks—adding yet more fuel to speculation that the FCC fabricated the story. On Monday, two Democratic senators demanded answers on the matter, and they’ve asked the FCC to explain what precisely went on by June 27th, 2018. On May 9, 2017, we sent you a letter regarding alleged cyberattacks on the Federal Communication Commission’s Electronic Comment Filing System during that month. There was also an ECFS issue involving the net neutrality proceeding in 2014. In our letter we asked that you keep Congress fully briefed as to your investigation. Beyond your initial internal analyses that you reference in your June 15, 2017, response, have any subsequent FCC or third-party (e.g., vendor, contractor, or government agency) analyses or investigations verified that a cyberattack on ECFS occurred in 2017 and. if so. that the attack is best classified as a DDoS attack? If not, why was no investigation conducted? Please provide any and all reports, findings, and other relevant details of any such investigations. In response to our May 2017 letter you provided information to us about the 2017 event. We request that you update, revise. and/or reaffirm in their entirety the responses that you previously provided, In addition, clarify whether you continue to classify the May 7-8, 2017, event as a DDoS attack and the basis for your classification. Have any FCC or third-party (e.g., vendor, contractor. or government agency) analyses or investigations concluded that a cyberattack occurred in 2014? Please provide any and all reports, findings, and other relevant details of any such investigations. Is the FCC fully cooperating with the Government Accountability Office review and evaluation of the FCC’s ECFS security and vulnerability to attack. including full access to the FCC’s accounts and data from any incidents as well as cooperation from relevant current and former FCC staff?